Red Sock, Blue Sock – Does It Really Matter? I got to spend an early Father’s Day with my two granddaughters, Isabella (just over 3 years old) and Leah (just over 1 years old) and it was a very special time. 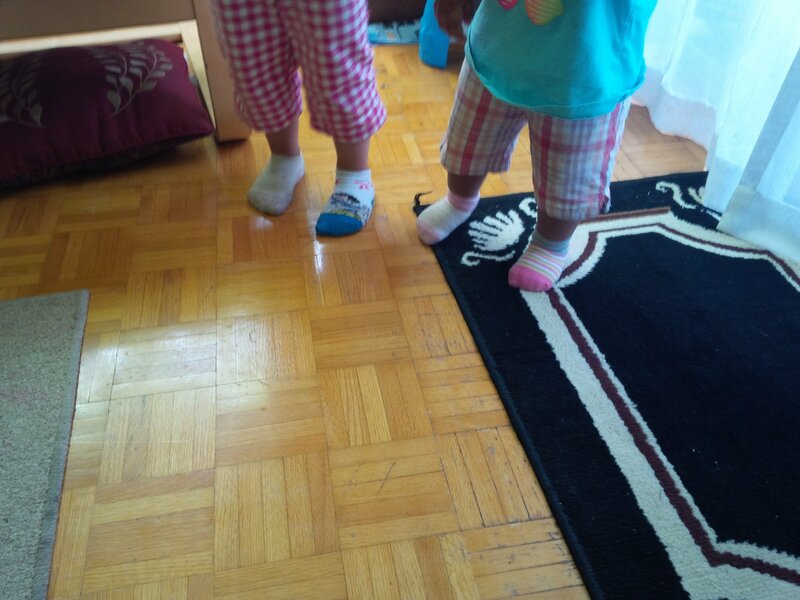 As you can see from the photo, the girls pick their own socks to wear each day. After taking the picture, I asked Isabella about she and her sister’s socks and in particular why each sock was different from the other. (I purposely avoided saying it was wrong or they didn’t match). Initially she said, “I don’t know, I just like them”. I pressed a little further and she said, “Grandpa, it doesn’t matter because my feet are warm”. That really got me thinking and connecting to some of the work I’m doing in Woodridge, IL, Gustine, CA, and Stockton, CA with teacher teams on redesigning their Math curriculum in connection to the outcomes of the CCSS. What I have enjoyed in facilitating the work thus far (aside from the excitement I always get working around teachers during their creative phase) is the openness with which teachers at all grade levels are thinking about their math instruction in a different way. What I’m optimistic about with the CCSS and using Larry Ainsworth’s Rigorous Curriculum Design approach to prioritize the standards and use that to build quality units of study, is the freedom it’s giving teachers to be creative. The groups I’m working with have been clear on the need to move away from the algorithmic approach to math instruction (learn the rule, practice the rule through multiple questions, regurgitate the rule on the test) to teach math conceptually and for understanding. The notion that there is more than one way to add fractions is driving them to let go of the “one rule” and be open to many options. The other options often help to cement the math concepts and potentially create more able math students (or at least more comfortable math students). You see, just like Isabella has realized if the purpose of socks is being met, how they look doesn’t matter, these teachers are seeing that if the answers are being achieved (and the math concepts are being understood as an added and needed bonus), how they get their also doesn’t matter.